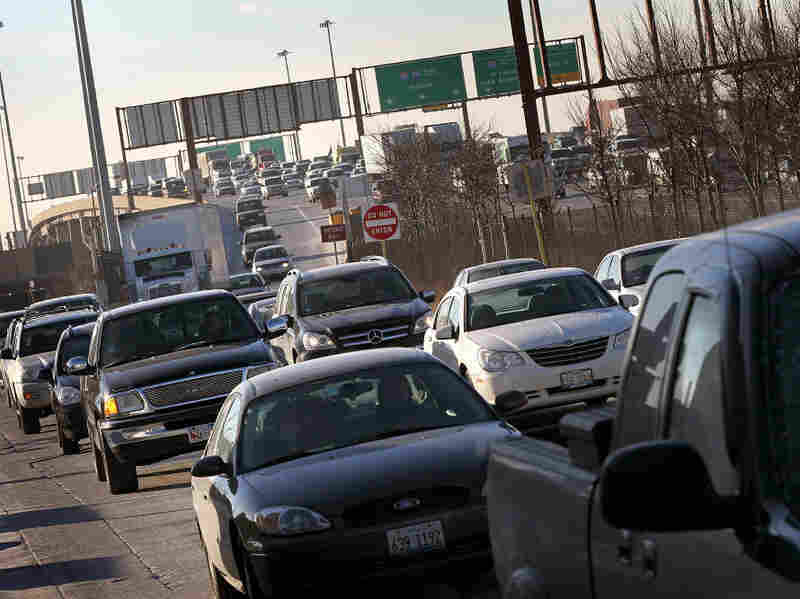 Chicago's 'Congestion Fee' Gets Chilly Reception Chicago Mayor Rahm Emanuel recently proposed a $2 fee on weekday parking in downtown public lots and garages to help pay for other transportation improvements like new bus routes and bike lanes. Other cities have had some success with similar plans, but some Chicagoans are skeptical. Motorists in Chicago navigate the morning rush hour as they make their way toward downtown. Chicago recently ranked as the city with the second-worst traffic congestion problem in the country, but it doesn't have a lot of money to invest in other transit options. Mayor Rahm Emanuel's solution? A $2 "congestion fee" on weekday parking in public lots and garages downtown. Other cities have had some success with congestion pricing for parking, but some Chicagoans are skeptical of the plan. Attorney Tom Higgins says he is not happy with the fee. At the downtown lot he parked in recently, prices start at $6 for 20 minutes but quickly skyrocket to $30 for staying between 101 minutes and 12 hours. "So unless you're staying here more than 12 hours, you're bleeding," Higgins says. He says he tries to take the train from his home in northwest Indiana whenever he can, but he can't always do so. "Based on what I do and my need to be able to travel to court in various outlying districts, I need my car, so I guess this is just another cost for working in the city," Higgins says. Colleen Karsted, a chef instructor at a downtown culinary school, pays a reduced parking rate — but even that just went up. "Now with an additional $2 tax, that puts me at $14 a day. It's just too much. I'll be on [Chicago's elevated trains], for sure." Karsted's response to the parking fee increase is exactly what city officials and urban planners are hoping for. According to Peter Skosey with the nonprofit Metropolitan Planning Council, the city needs to keep the central business district — and not the number of cars — growing, with people coming downtown to work, shop and play. "We have to start looking at how we increase the number of people that come in by trains and buses, and on bikes and on foot," Skosey says. He says the key to Emanuel's proposal is that it would dedicate revenue from the congestion fee to improving other transportation options — from mass transit stations and new bus routes to new bike lanes — so people forced out of their cars by higher prices would have more options. But not everyone is convinced this is the right approach. "I do not think a $2-a-day charge on off-street parking is the way to go," says Donald Shoup, a professor of urban planning at UCLA. His book, The High Cost of Free Parking, prompted many cities to rethink how they price downtown parking. Shoup says a $2 increase may not be enough to get many commuters to leave their cars at home, especially if their employers cover all or part of the parking cost. Also, he says, raising prices in parking lots and garages might only increase the number of drivers circling around in search of street parking, adding to congestion. "I think the most important thing to do for any city is to get the price of curb parking right," Shoup says. That's the approach some other cities are taking. San Francisco, for example, is experimenting with parking meters that change prices block to block and at different times of day, based on supply and demand. Seattle, Los Angeles, Washington and other cities are also trying congestion pricing on street parking. Shoup and other urban planners say Emanuel should consider incorporating meters and other options into his plan, which will be voted on by the City Council next month.